The Archbasilica of St. John Lateran is the oldest and most important of the four Major Papal Basilicas in the Catholic Church. And, it is this because it is the seat, or cathedra, of the Pope, the Bishop of Rome. The present basilica stands on the site of an ancient palace on the Celian Hill (one of the famous seven hills) of Rome which formerly belonged to the family of the Laterani. This palace was part of the dowry of Fausta, the wife of the Emperor Constantine; and, Constantine gave it to the Church* around year 324 A.D., when he converted a portion of the Laterini palace to serve as the papal residence. ** The original dedication was to the Redeemer (S. Salvator–see the words [Christo Salvatore] in the picture above); but after destruction by an earthquake in 896 A.D., the church was rebuilt by Pope Sergius III (904–11), who dedicated it to St. John the Baptist. After the fire of 1308, it was restored by Pope Clement V (1305–14); but it was again burnt down in 1361. The present church was built under the direction of a succession of Popes beginning with Pope Urban V.* St. John Lateran has been host to a number of Lateran councils (some ecumenical) from the 7th to the 18th centuries. * Very fittingly, two inscriptions on the façade say that it is is “the Mother and Head of all Churches, in the City and of the World” (see picture on the right). 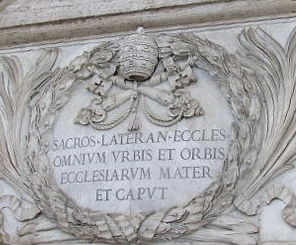 It’s commonly known as St. John Lateran because it was dedicated to both St. John the Baptist and St. John the Evangelist (see inscription on picture above). ** It is located outside of Vatican City, but retains all the diplomatic status of the Vatican. ****From a sermon by Saint Caesarius of Arles, Second Reading, Office of Readings, November 9th, Liturgy of the Hours. Art: Archbasilica of St. John Lateran HD, Livioandronico2013, 21 April 2015, CCA-SA; “Sacrosancta Lateranensis ecclesia omnium urbis et orbis ecclesiarum mater et caput”, incised in the front wall of the basilica; Laurel Lodged, 1 April 2010, PD-Worldwide; both Wikimedia Commons.